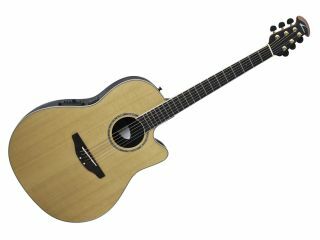 The CC29S-4C features a solid cedar top. NAMM 2012 PRESS RELEASE: Ovation is pleased to announce the addition of two new models to its popular and value-conscious Celebrity CC Series, a line that brings Ovation's groundbreaking saddle pickup technology and legendary sound within everyone's reach. The new CC Series CC29S comes in natural or New England Burst and offers comfort in any playing position, and Ovation's ergonomically designed Contour body provides improved acoustic performance, the ultimate ease of playing, and an unbeatable price point. Beyond the revolutionary Contour body, the CC29S also features a solid Cedar top, rosewood fingerboard and bridge, chrome hardware, and Ovation's own OP4BT preamp with on-board tuner. The new CC49S-VA marks Ovation's first multi-sound hole Celebrity model to offer the benefits of its innovative Contour body. Improved ergonomic bowl shaping gives the guitar a more comfortable feel and provides a jumbo guitar-sized acoustic response with the feel of a smaller bodied-instrument. The CC49S-VA also features a solid spruce top finished in a Vintage Amber stain, rosewood fingerboard and bridge, chrome hardware, and Ovation's own OP4BT preamp with on-board tuner - all at a price point lower than ever. Information taken from official press release, for more visit Ovation.